Mark did this recent blog on Restoring A Late Patent-Era House Pipe (Pt. 1). He highlights several restoration methods that are worth noting. Thanks Mark. The System’s 120th Anniversary is September 3rd! That’s right, next Monday, September 3rd, 2018 marks the 120th anniversary of the 3rd and final patent of Charles Peterson’s celebrated System pipe. I’ve been trying since last spring to get folks interested in celebrating, but it looks like it’ll just be you and me this year. To start things off, I thought I’d share a detailed look at the history and restoration of a rare System House Pipe in the collection of James Arrington. He and I have been trading emails about a few of his vintage Petes, and when he asked if I knew someone who might be interested in restoring this one, I volunteered for the job. James is a brave soul. This entry was posted in Pipe Refurbishing Essays on August 30, 2018 by rebornpipes. I don’t remember where this pipe came from but it showed a lot of promise. It is stamped Nording Made in Denmark in a circle with an “A” in the center of the circle on the underside of the shank. The bowl is sandblasted around the bowl and shank. The stamping is on the smooth panel on the underside of the shank. There is a smooth ring of briar on the shank just ahead of the yellow acrylic ring. The ring is asymmetrical like the shank. The rim top is a combination of smooth briar curving upward to plateau on the rim top. The stem was vulcanite and was oxidized and had some calcification on each side of the stem for the first inch ahead of the button. I think that at some point in its life before it came to me it had a rubber Softee bit on the stem to protect it from tooth marks and chatter. It had done its job and there were no tooth marks or chatter on the surface of the stem. I took the following photos of the pipe before I worked on it. I took some close up photos of the rim top and the stem to show the condition it was in when I started the cleanup. The plateau on the rim was dirty with dust and tars in the grooves of the plateau. The grooves of the sandblast were also dusty and dirty. The inside of the bowl appeared to be in good condition under the thin cake. The close up photos of the stem shows the oxidation and calcification on the surface. On the second photo, the top side of the stem you can see the faint remnants of the Nording signature N. There is very little of the stamping left in the vulcanite. The vulcanite stem has an interesting spiral look that gives a sense of whimsy to the pipe that will become more apparent after the polishing. I took a photo of the underside of the shank – you can see the circular Nording Made in Denmark encircling a capital “A”. The yellow acrylic shank extension. I reamed the bowl with a PipNet reamer using the second and third cutting heads to take the cake back to bare briar. I cleaned up the remnants of cake in the bowl with a Savinelli Fitsall Pipe Knife. I finished the cleaning of the inside of the bowl with 200 grit sandpaper wrapped around a piece of dowel. I turned it in the bowl until the bowl was smooth and clean. I scrubbed the exterior of the bowl with a tooth brush and Murphy’s Oil Soap. I scrubbed the plateau rim top with a brass bristle brush to remove the tars and oil in the grooves. I rinsed the bowl with warm water in the sink while scrubbing the finish with the tooth brush to remove the dust and grime. I took photos of the pipe after cleaning. It was starting to look very good. I scrubbed out the mortise and the airway in the shank and stem with pipe cleaners, cotton swabs and alcohol. Once the grime was removed the pipe smelled good and looked good. I rubbed some Before & After Restoration Balm into the surface of the briar to enliven, clean and preserve it. I rubbed it in with my fingertips working it into the briar. I worked it into the plateau rim and the sandblast on the sides of the shank and the bowl. I buffed it into the finish with a horsehair shoe brush. I set it aside for a little while to let the balm do its work. I buffed it off with a cotton cloth and a shoe brush. The photos below show the pipe at this point in the restoration process. I set the bowl aside and turned my attention to the stem. I sanded the oxidation and the calcification on the stem with 220 grit sandpaper. I was able to remove the oxidation and the calcification and the stem actually began to look really good. I polished the stem using micromesh sanding pads – wet sanding with 1500-2400 grit pads and then buffing on the wheel with red Tripoli. I dry sanded the stem with 3200-12000 grit pads to further polish it. After each pad I wiped it down with Obsidian Oil to protect and enliven the stem. When I finished with the final pad I gave it the stem another coat of oil and set it aside to dry. This interesting mixed finish Freehand is a classic Nording. Everything about the shape, style, and the craftsmanship of the stem say Nording. The Nording Made In Denmark stamp with the “A” in the middle gives the grade of the pipe. I am not sure where it fits in the Nording hierarchy but it is a well-made pipe. The shape of the pipe takes full advantage of the sandblast grain on the briar. The mix of grains – straight, flame and birdseye all work together to give the sandblast finish a beautiful look from any direction it is viewed. The reddish colour of the bowl and shank with the bright yellow acrylic shank work together well with the polished black of the vulcanite stem. I buffed the bowl and the stem with Blue Diamond polish to raise the shine on the briar and the vulcanite. I was careful to not buff the stamping and damage it. I gave the bowl and the stem multiple coats of carnauba wax. I buffed the entire pipe with a clean buffing pad to raise the shine. I hand buffed it with a microfiber cloth to deepen the shine. The finished pipe is shown in the photos below. The dimensions of the pipe are: Length: 6 inches, Height: 2 1/4 inches, Outside Diameter: 1 3/4 inches, Diameter of the chamber: 7/8 of an inch. It is an interesting pipe and should make a great addition to anyone’s rack. Thanks for walking through the restoration with me. This entry was posted in Pipe Refurbishing Essays and tagged Bowl - finishing, buffing, Eric Nording pipes, finishing, micromesh sanding pads, Nording A Made in Denmark freehand, Nording Freehand pipes, Nording Made in Denmark Freehand pipes, Nording Made in Denmark Pipes, Nording Pipes, Oxidation, pipe refurbishing, polishing, polishing a stem, polishing stems, refurbishing, removing oxidation, sanding a stem, stem work, vulcanite, waxing, waxing a stem on August 30, 2018 by rebornpipes. This large sized Sasieni was always on my mind to work on and I wanted to work on it at leisure as I wanted to do justice to this solid large piece of briar. What intrigued me was the shape of the stem towards the bore end where it flared out to a large extent which was made more pronounced due to pinching of the stem between the saddle and button end. The pipe has beautiful, densely packed small sized birdseye grain on the right side of the stummel while the left side has a mix of straight and birdseye grains. The front and back of the stummel has densely packed cross grains. The shank has a flat bottom in the middle making it a sitter and has cross grains running across the top and bottom surface. Right and left side of the shank shows small, beautiful and densely packed birdseye. The shank, on the left side, bears the stamp of “Sasieni” over “FANTAIL” and football COM stamp of “MADE IN” over “ENGLAND” towards the bowl. At the edge of the shank where it meets the stem, it is stamped “PATD- 170067”, which has been circled in red. On the right side, it is stamped “LONDON MADE” with numeral “55” towards the bowl. The stem bears the stamp “F” on the left side of the saddle. Except for the PATD number, the stampings are crisp and clear. I wanted to gain some background information about this brand and unravel some detailed information and period it was made in, about this particular pipe that I have been working on. There are three sites I frequent for information, first being Pipedia.com, second is pipephil.eu and the third being rebornpipes.com. Over a period of time, I have realized that Mr. Steve Laug has been working on pipes for such a long time that there are hardly any brands and models that he has not worked on and so, instead of reinventing the wheel, I first visit rebornpipes to eke out necessary information I seek. Luckily for me, Mr. Steve had indeed worked on a Sasieni Fantail wire rusticated and has researched this pipe. Here is the link to the blog written by him for necessary information and is a highly recommended read, https://rebornpipes.com/2017/06/07/sasieni-fantail-wire-rusticated-patent-billiard/. I now know that “FANTAIL” is a Sasieni second line pipe and is from the “Family Era” from the period 1946 to 1979. Mr. Steve, thank you Sir for allowing me to reproduce your work in my write up. Now, that my curiosity has been satiated, I progress to my visual inspection of the pipe. This large sized straight billiard has its stummel covered in dust, oils and grime giving it a dull and sad appearance. The front of the stummel has two chips and will need to be addressed. The chamber has a thick cake which has been evenly reamed to a nice thickness of a dime!!!!! Either my grand old man had learned to care for his pipe during later years or this one belonged to his friend!!!! The rim top is clean but shows some darkening along the entire surface. The inner and outer edges of the rim are intact. It has a faint sweet smelling cake. The mortise and shank is clogged and will require a thorough cleaning. It is the stem which has, comparatively, the most damage on this pipe. Both the surfaces have tooth chatter and a couple of deep bite marks. This needs to be addressed. Now that I have moved out of my hometown for work, I sorely miss Abha’s help in cleaning the chamber and the stummel. I cleaned the chamber of all the cake by reaming it with a Kleen Reem pipe cleaner. With my fabricated knife, I scrap the bottom and the walls of the chamber of all the remaining cake taking it down to solid bare briar. To smooth out the surface and get rid of last remnant cake, I sand it down with a 220 grit sand paper. I cleaned the internals of the shank and mortise with pipe cleaners and cue tips dipped in isopropyl alcohol (99.9%). I use this alcohol as it evaporates rapidly and leaves no odor behind. The chamber is now clean, smooth and fresh smelling. The internal walls of the chamber are solid with no signs of burn out or heat fissures, which is definitely a big relief. I resorted to light sanding of the rim edges with 220 grit sand papers to remove the very minor dents and chips on the inner edges. The rim surface does show darkening all along. I address this issue and the issue of a dirty stummel by cleaning it with Murphy’s oil soap and a tooth brush. I rinse it under tap water and dried it with paper towels. Thereafter I sand the rim surface with micromesh pads, wet sanding with 1500 to 2400 grit pads and dry sanding with 3200 to 12000. I wipe down the rim surface with a moist cloth to get rid of the sanding dust. I address the two chips in the front of the stummel by spot filling each chip with clear CA super glue. I let it cure overnight. Next day, with flat head needle file, I sand down these fills and further match these fills with the stummel surface using 400 and 800 grit sand papers. I am satisfied with the end result. Turning my attention to the stem, I clean the surfaces of the stem with alcohol and cotton pads. I sand the stem with a 220 grit sand paper to even out the minor tooth chatter and fill the deeper tooth bite marks with CA super glue and set it aside to cure for about a day. After the glue had cured, I sanded the fills with a flat head needle file. To further match the fills with the surface of the stem, I sanded it with 220, 400 and 800 grit sand paper. I wiped the stem with cotton pad dipped in alcohol to remove the resultant dust. I rubbed some extra virgin olive oil in to the stem and set it aside to be absorbed in to stem. I polished the stem with micromesh pads, wet sanding with 1500 to 2400 grit pads and dry sanding with 3200 to 12000. I rub a little extra virgin olive oil in to the stem after every three pads. I finish the polishing of the stem by rubbing a small quantity of Paragon wax and giving it a final polish with a soft cotton cloth. The stem is now nice, smooth and shiny. I fill the “F” stamp on the stem with whitener and carefully remove the extra smear, revealing a clear and bold stamp. Once I was satisfied with the stem repair, I started work on the stummel which has dried by now. I rub a small quantity of “Before and After Restoration Balm” in to briar and let it rest for a few minutes. The balm almost immediately works its magic and the briar now has a nice vibrant appearance. I further buff it with a horse hair shoe brush. To finish, using a cotton cloth and brute muscle power, I gave it a final polish. I re-attach the stem with the stummel. The completed pipe looks lovely, fresh and vibrant; the photographs speak for themselves. Thank you for having the patience to reach this far while reading the write up. Your comments are of utmost importance to me for improving my skills in restoration process as well as writing about it. Cheers!!!!! PS: Apologies for poor quality of pictures. I will definitely try to work on it. This entry was posted in Pipe Refurbishing Essays and tagged article by Paresh Deshpande, bite marks, Bowl - finishing, buffing, finishing, micromesh sanding pads, Oxidation, Paresh Deshpande article, pipe refurbishing, polishing, polishing a stem, polishing stems, refinishing, refurbishing, removing oxidation, removing tooth marks, repairing bite marks, repairing tooth marks, Sasieni Fantail 55 Smooth Billiard, Sasieni Fantail Pipe, Sasieni PATD- 170067 pipe, Sasieni Pipes, Stem repairs, stem work, super glue, vulcanite, waxing, waxing a stem on August 28, 2018 by rebornpipes. Restoring a Mystery Freehand – a Hand Made in Denmark. Is it a Preben Holm? Jeff found this old pipe in an antique shop in Stevensville, Montana. He continues to show that he has an eye for old and unique pipes. This one is a tall, stack Freehand pipe with a large bowl and beautiful grain patterns around the sides of the bowl and shank. There is straight, flame and birdseye grain around the sides, top and bottom of the bowl. The rim cap is smooth and a mix of grain patterns. The finish was dirty but seemed to have a matte finish under the grime and grit. The rim top had an overflow of tars, oils – lava from the thick cake in the bowl. It was truly a mess but the buildup probably protected the inner and outer edges of the rim. It was stamped on the underside of the shank just ahead of where the stem is inserted. It is simply stamped Hand Made over In over Denmark. The stamping is identical to the stamping on Ben Wade Pipes that I have in my collection and something in my memory says I have read that somewhere. The stem has chair leg turnings that are similar to many freehand pipe stems. There is nothing stamped on the side or top of the stem. Jeff took photos of the pipe before he started his cleanup work. Jeff took some close up photos of the rim top to show the condition of the bowl and rim. There was some overflow of lava and dirt on the rim top and there was a pretty thick cake in the bowl. The pipe is quite tall and the cake went to the bottom of the bowl. The inner and outer edges looked to be in good condition. Jeff took photos of the bowl from various angles to show the condition of the finish. The beautiful grain is visible in the photos. The finish is dirty but looks good under the grime. The stamping on the underside of the shank is clear and readable. It simply reads Hand Made with a faint stamp “In” below that followed by Denmark. The second and third photos below show the damage to the left edge of the shank. There were some chips and nicks in the finish. None were too deep in the briar so would need to rework that area of the shank. The stem was in decent condition. It was oxidized on both sides and there were some nicks and tooth marks and chatter on both sides near the button. There were no deep tooth marks which is really a relief. I reread the articles on Pipedia and Pipephil on both Preben Holm and Ben Wade pipes. I could not find the comment I was looking for on the Hand Made In Denmark stamp. So I would not have the luxury of knowing the history or who the carver was. Many things about the pipe made me still think it was a Ben Wade pipe but I may never know. I am hoping one of you who are reading this might have a clue for me. Jeff has become a magician in cleaning up pipes. When I get them they are clean to the point of looking almost new. It is nice to work on pipes that he has cleaned up once again. In this case he reamed it with a PipNet reamer and smoothed the walls of the bowl with a Savinelli Fitsall pipe knife. He scrubbed out the mortise and the airway in the shank and the stem with alcohol, cotton swabs and pipe cleaners. He scrubbed the exterior of the bowl, rim and shank with a tooth brush and Murphy’s Oil Soap to the oils and tars on the bowl, rim and shank. He rinsed it under running water. He dried it off with a soft cloth. He was able to remove all of the buildup on the rim top and the grime from the bowl. He soaked the stem in Before & After Deoxidizer and when it had done its work rinsed and cleaned the airway with pipe cleaners and alcohol. The tooth marks were clean but visible. I took photos of the pipe to show its condition before I started my work on it. I took some photos of the rim top to show what it looked like after Jeff had cleaned off the grime and tars. The briar was in good condition but there were some nicks and scratches in the flat top but none appeared too deep. The inner and outer edges of the bowl looked very good. The stem had cleaned up really well with the deoxidizer and need repair and polishing. It showed tooth marks on the underside and some chatter but it was otherwise in good condition. I decided to address the chips on the left side of the shank and reshape the shank end first. I sanded out the chips and reshaped the edge with a folded piece of 220 grit sandpaper. I shaped it to match the shape of the shank edge on the right side of the pipe. I worked on the end view as well. I wiped down the bowl with alcohol on cotton pads to remove the debris and dust from the clean up. I worked on the rim top as well to work on the darkening that was on different parts of the rim. I rubbed some Before & After Restoration Balm into the surface of the briar to enliven, clean and preserve it. I rubbed it in with my fingertips working it into the briar. I worked it into the edges of the shank and the bowl. I set it aside for a little while to let the balm do its work. I buffed it off with a cotton cloth. The photos below show the pipe at this point in the restoration process. The rim top still had some areas on the left side and back edge that would need to be worked on. You can see it as a line around the bowl. I have circled the area in red so that you can see what I am noting at this point. I worked on the rim top and the edge of the shank that I had reshaped with micromesh sanding pads. I wet sanded the rim top and the left side of the shank with 1500-2400 grit pads and was able to remove the circled damage on the rim and blend the edge of the shank. I polished it by dry sanding it with 3200-12000 grit sanding pads. I wiped the areas down after each pad with a damp cloth to remove the dust. I touched up the stain on the top of the rim and left edge of the shank to blend those areas into the colour on the rest of the pipe. I used a Maple and Cherry stain pen to approximate the colour of the pipe. I still need to buff the bowl and shank but the colour appears to be a perfect match. I buffed the bowl and shank with Blue Diamond on the buffing wheel and gave the bowl a coat of carnauba wax. I buffed it with a clean buffing pad to raise a shine and blend the stain into the rest of the finish. I took the following photos to show the bowl at this point in the process. I set aside the bowl and turned my attention to the stem. I wiped down the stem with alcohol and filled in the tooth marks on the top and underside with clear super glue. I set the stem aside to let the repairs cure. When the repairs cured I sanded them with 220 grit sandpaper to blend them into the surface of the vulcanite. I wiped it down with Obsidian Oil and took some photos of the stem at this point. I polished the stem using micromesh sanding pads – wet sanding with 1500-2400 grit pads and then buffing on the wheel with red Tripoli. I dry sanded the stem with 3200-12000 grit pads to further polish it. After each pad I wiped it down with Obsidian Oil to protect and enliven the stem. I polished it further with Before & After Pipe Polish – both Fine and Extra Fine. When I finished with the polish I gave it a final coat of oil and set it aside to dry. This smooth finished stack Freehand is an interesting and unusual piece. The Hand Made In Denmark stamp on the shank I think is one of Preben Holm’s marks but I cannot prove it. The shape of the pipe takes full advantage of the grain on the briar. The mix of grains – straight, flame and birdseye all work together to give this pipe a beautiful look from any direction it is viewed. The reddish brown of the bowl and the black of the vulcanite stem contrast well together. I buffed the bowl and the stem with Blue Diamond polish to raise the shine on the briar and the vulcanite. I was careful to not buff the stamping and damage it. I gave the bowl and the stem multiple coats of carnauba wax. I buffed the entire pipe with a clean buffing pad to raise the shine. I hand buffed it with a microfiber cloth to deepen the shine. The finished pipe is shown in the photos below. The dimensions of the pipe are: Length: 6 inches, Height: 2 3/4 inches, Outside Diameter: 1 1/2 inches, Diameter of the chamber: 7/8 of an inch. It is an interesting old pipe and should make a great collectible piece. Thanks for walking through the restoration with me. This entry was posted in Pipe Refurbishing Essays and tagged bite marks, Bowl - finishing, Bowl - refinishing, Bowls - refinishing, buffing, finishing, Hand Made in Denmark Freehand, Hand Made in Denmark Freehand Stack, Hand Made in Denmark pipe, micromesh sanding pads, Oxidation, pipe refurbishing, polishing, polishing a stem, polishing stems, refinishing, refurbishing, removing oxidation, removing tooth marks, repairing bite marks, repairing tooth marks, reshaping a shank end to repair chips, restaining, restaining a bowl and rim, sanding a stem, Stem repairs, stem work, vulcanite, waxing, waxing a stem on August 28, 2018 by rebornpipes. The next pipe on the work table is a Brakner Antique Hand Cut. It has a very interesting shape that is unique to Brakner. It has an eye shape bowl with a rim top that is smooth. The finish is rusticated in a unique style that he developed that I have never seen before seeing this pipe. There is a smooth band around the end of the shank and a smooth panel on the underside of the shank that is stamped. It came to me from a friend who is having me work on and sell some of his pipes. This one is a beauty and it comes in its own brown leather case that I will show once I have finished the pipe. I have included the photos of the pipe before I cleaned it up. This pipe was well cared for by the previous pipeman who owned it. The finish on the sides and shank was in excellent condition but dusty. The rim top was dull and had a film of tobacco oils on it but was otherwise undamaged on the inner and outer edge. It has some interesting grain. The contrast of dark and medium brown stains highlighted the beautiful grain on the briar and went well with the rusticated finish on the bowl and shank. The bowl was lightly caked and would need to be reamed but otherwise good condition. The stem was oxidized and lightly pitted from the oxidation. There was some light tooth chatter on both sides of the stem near the button as well as some calcification. The next close up photos of the rim top and both sides of the stem show the overall condition of the pipe. I took three photos of the stamping on the underside of the shank to capture the stamping that flows on the curves of the shank. They all give various angles of the stamping as it is quite wide and cannot be contained in one photo. The top line of the stamping reads BRAKNER ANTIQUE. The second photo shows the second line of the stamp – it reads HAND – CUT 807. The third photo shows the third line of the stamp – it reads DENMARK 37152. The stamping follows the curve of the shank band. I took the stem off the pipe and dropped it in the Before & After Deoxidizer Bath to soak over night. If you have been following the blog for any length of time you have come to know that when I am working on interesting old pipes (even sometimes those not so interesting) I like to know a bit about the background of the brand. I like to “meet” the carver to get a feel for their work and style. This is the first Brakner I have worked on so I felt compelled to do a bit of reading before I started the cleanup of the pipe. Peter Micklson (†) started his career at the Teofil Suhr workshop, Suhr’s Pibemageri, in Copenhagen, where Sixten Ivarsson was the foreman. He brought in Poul Rasmussen and taught him the two or three important things about pipemaking in a six weeks crash course, before he went off to join Poul Nielsen, the later Mr. Stanwell. The pipes came in three different series. Antique series. Antique finish in tan or black. Smooth pipes also. Each pipe 7.50 $. Bella Danica series. Antique finish in tan or black. Each pipe 10.00 $. The latter were named after the Royal Danish Guard Regiment, founded in 1689. Brakner was one of the first high-end carvers from Denmark to enter the US market and was considerably successful there in the early 1970’s. After his sudden death Peter Brakner’s name faded back from the forefront, but his pipes speak to the injustice of that. His body of work has earned him a place in the important history of Danish pipemaking. The Pipedia article also showed pages from a W.Ø. Larsen Catalog from 1961-1962. I have included the pages from the site. The catalog showed the variety of shapes that pipe came in as well as the unique finish of the micro-rustication. I have circled the shape of the pipe I am working on in red. 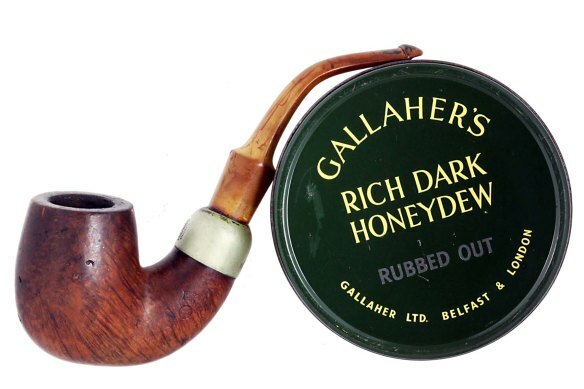 That gives a good picture of the history and development of the Brakner brand and the connection to some of the great carvers of Danish pipe history. Armed with that information I turned to work on the pipe in hand. I started my cleanup of this pipe by working on the internals. I reamed out the cake with a Savinelli Fitsall Pipe Knife and took the cake back to the bare briar. I sanded the walls in the bowl with a piece of dowel wrapped with 220 grit sandpaper to smooth the walls. I worked some Before & After Restoration Balm into the surface of the micro-rusticated briar with my fingers and with a shoe brush. I use the Balm to enliven, clean and preserve the briar. I set it aside for a little while to let the balm do its work. I buffed it off with a cotton cloth and then buffed it with a microfiber cloth. The photos below show the pipe at this point in the restoration process. I took the stem out of the Before & After Deoxidizer Bath and rinsed it under runner warm water. I blew air through the stem and then ran water through it as well to rinse out the inside of the airway. The bath removed the oxidation and left the stem in clean condition. I took photos of it at this point to show how it looked. The Deoxidizer did its work well. I cleaned out the mortise and the airway in the shank and the stem with cotton swabs, pipe cleaners and alcohol. It was dirty but I was surprised it was as clean as it was all things considered. The stem was in excellent condition when it came out of the Deoxidizer so I did not have to sand it with any of the usual 220 grit folded pieces. I was able to immediately move on to polishing it with micromesh sanding pads. So under the watchful eye of my shop supervisor, Spencer (my 14 year old Cocker Spaniel) I polished the stem using micromesh sanding pads – wet sanding with 1500-2400 grit pads dry sanding with 3200-12000 grit pads. After each pad I wiped it down with Obsidian Oil to protect and enliven the stem. Spencer sits next to my desk/work table whenever I am working on pipes. Periodically he will knock me on the leg for a treat I keep on top of the desk just for these occasions. Mostly though he just watches me work and when I get up for a break he follows me like a shadow. I am sure going to miss his presence once he is gone but for now he continues to go strong. Back to the pipe, I polished it further with Before & After Pipe Polish – both Fine and Extra Fine. When I finished with the polish I gave it a final coat of oil and set it aside to dry. The pipe came with its own case. I was told that the previous pipeman purchased this pipe directly from Peter Brakner himself when he visited Peter in Denmark. The case is in great condition. There are some scuff marks in the leather but it is solid and well made. The lining is also in good condition. I have included a photo below of the restored pipe in the case to give a sense of the fit. I am sure the case was made for this pipe. This is the first Brakner Antique Danish Hand Cut that I have worked on. The micro-rustication process that he developed is really quite beautiful and leaves an almost sandblasted pattern behind on the briar. It swirls and undulates around the bowl almost as if it is living. The smooth rim with contrasting stain and the thin band around the shank end and on the underside is quite nice and has some swirls of grain in the briar. The contrast browns of the bowl look really good with the black of the polished vulcanite stem. I carefully buffed the bowl with Blue Diamond on the buffing wheel so as not to have the polish build up in the rustication. I buffed the stem with Blue Diamond polish to raise the shine in the vulcanite. I was careful to not buff the stamping and damage it. I gave the bowl multiple coats of Conservator’s Wax and the stem multiple coats of carnauba wax. I buffed the entire pipe with a clean buffing pad to raise the shine. I hand buffed it with a microfiber cloth to deepen the shine. The finished pipe is shown in the photos below. The dimensions of the pipe are: Length: 7 inches, Height: 2 1/4 inches, Outside Diameter: width is 1 1/2 inches and length is 2 inches, Diameter of the chamber: ¾ of an inch. This Brakner is a well-made pipe with a beautiful finish and a comfortable stem. I am waiting to hear from the fellow who asked me to clean up the pipe so that I can get a price set that he wants for it. Once I have that I will be adding it to the rebornpipes store shortly if you are interested in adding it to your rack. Thanks for walking through the restoration with me. This entry was posted in Pipe Refurbishing Essays and tagged Bowl - finishing, Brakner Antique Hand Cut 807, Brakner Antique Hand Cut Danish Pipes, Brakner Antique Pipes, Brakner pipe stampedDENMARK 37152, Brakner Pipes, Brakner's Micro-Rustication finish, buffing, Cased Brakner pipes, finishing, micromesh sanding pads, Oxidation, pipe refurbishing, polishing, polishing a stem, polishing stems, refurbishing, removing oxidation, vulcanite, waxing, waxing a stem on August 26, 2018 by rebornpipes. “Mirror, mirror on the wall, who is the prettiest of them all?” asked this “Omega”, looking deeply into my eyes!!!!! How I wish I could have promptly replied that it was “YOU”…. but I could not get myself to say so!!!!! It was then that I decided to work on this pipe and make an attempt at its transformation. Dr. Grabow pipes are the quintessential American brand. Made with care in the Blue Ridge Mountains of North Carolina, this 60-year-old line of inexpensive tobacco pipes is a favorite among new pipe smokers for its consistency and good taste. The famous smoking pipe brand gets its name from the owner Dr Grabow, a general physician who lived in Chicago. Made in America since the 1930’s, Dr. Grabow tobacco pipes were named after “the good doctor” to help polish the smudged image of smoking a pipe to newly tobacco-leery American public. The line of pipes bearing Dr. Grabow’s name have become one of the best known pipe brands in North America. 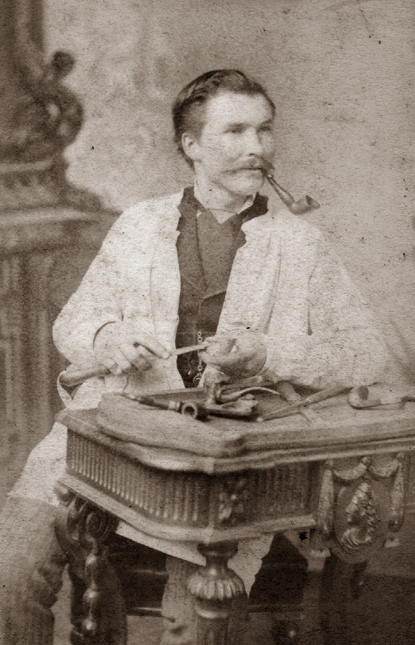 The Dr Grabow pipes first began with Louis B Linkman of the M.Linkman and Co of Chicago. The trademark “Dr Grabow” itself actually begun at about 1932 and had the US patent number 1.896,800. The birth of the Dr Grabow smoking pipe is simple enough. It started off when Dr Grabow himself and his acquaintance Dr Linkman regularly visited the local pharmacist at Brown’s Drug Store in Lincoln Park Chicago. Dr Linkman was on the lookout for a doctor’s name to Christian an innovative line of pipes in order to mellow out the smoking apparel’s smoggy image. He asked Dr Grabow to allow him to use his name to which he agreed and the name has stuck since then. Linkman continued to manufacture his Dr Grabow pipes until 1953. The earliest of these exclusive pipes were stamped both with Linkman’s and Dr Grabow. They included a propeller emblem that was white in color at the top of the mouthpiece. In 1944 the white propeller emblem was replaced with a white spade, a move that heralded the introduction of Linkman’s new Dr Grabow pipes. All of the newer entries included most of the earlier favorites as well as “TRU-GRAIN” and “SELECT”. Later models of Dr Grabow pipes were described as Imported Briar. (b) Get some shine on the stummel. (c) Attempt to reveal the grains on the smooth shank. (d) Highlight the contrast between the raised portions of the rustication with that of within the rustication. Having identified what needs to be done, I turned my attention to how it could be done. SWOT analysis dictated that I needed to adopt processes which did not require any stains or coatings of lacquer as I did not have any. Also since I do not have any mechanical equipment, I had to adopt simpler and manual techniques. I decided that the best and easiest course of action for me would be to get rid of the original stain. I started by reaming the chamber with a Kleen Reem pipe reamer and fabricated knife. I removed the complete cake from the chamber. I further sanded down the walls of the chamber with a 220 grit sand paper to smooth the walls and took the cake back down to the bare briar. I gently scraped out the little overflow of lava from the rim top. I also cleaned out the mortise and the shank with cue tips and pipe cleaners dipped in alcohol. Once the chamber was cleaned, I turned my attention to the stummel and tried to get rid of the lacquer coating. I started by wet sanding with a 1500 grit micromesh pad and soon realized that it would not work. I tried sanding with 800 grit sand paper without any success. Soon I found myself sanding the stummel with 150 grit sand paper. The lacquer was very difficult to get rid off and after a considerable time, I was finally able to completely remove the lacquer coating. Believe you me, my fingers had started to hurt and sitting at the table for 3-4 hours at a stretch caused cramps in my back. But the end result was pleasing. Then began the arduous and time consuming process of sanding the stummel with micromesh pads. I proceeded to sand the stummel with micromesh pads, going through wet sanding with 1500-2400 pads and dry sanding with 3200- 12000 grit pads. I was very pleased with the way the stummel had turned out. I decided that I liked this finish and after further cleaning and polishing, the stummel would look just beautiful. Once I was through with micromesh pads, I cleaned the stummel with undiluted Murphy’s oil soap and tooth brush. I paid special attention to the deep areas of the rustication, thoroughly cleaning it with the brush. I dried the bowl with cotton cloth and paper towels. I rubbed “Before and After Restoration balm” in to the stummel with fingers deep into the rustications and let it rest for a few minutes before I buffed it with a horse hair brush. Finally, I polished the stummel with a soft cotton cloth and muscle power!!!! I also polished the nickel ferrule with a jeweler’s cloth. Luckily, the corrosion was superficial and polished up nicely. Turning my attention to the badly damaged stem, I start by cleaning it with cotton pads dipped in isopropyl alcohol. I flamed the stem surface with a Bic lighter to raise the tooth chatter. The deeper tooth chatter and bite marks were filled with clear CA superglue. Thereafter began the time consuming process of curing, sanding with flat head needle file, 220 grit sand paper and finally by micromesh pads. In all, I had to repeat the fill and sand procedure thrice before resorting to final polish using micromesh pads. I also cleaned out the internals of the stem with pipe cleaners dipped in alcohol. To finish the pipe, I rubbed a small quantity of Halcyon wax II on to the stummel and gave it a nice polish. The pipe now does look stunning. I love the way the pipe has turned out and I can proudly reply back to this Omega “IT’S YOU!!!!! !” The finished pipe is shown below. This entry was posted in Pipe Refurbishing Essays and tagged article by Paresh Deshpande, bite marks, Bowl - finishing, Bowl - refinishing, buffing, Dr. Grabow Omega, Dr. Grabow Omega pipes, Dr. Grabow Omega System pipe, Dr. Grabow pipes, finishing, micromesh sanding pads, Oxidation, Paresh Deshpande article, pipe refurbishing, polishing, polishing a stem, polishing stems, refinishing, refurbishing, removing oxidation, removing tooth marks, Repairing a stem with super glue and charcoal powder, repairing bite marks, repairing tooth marks, sanding a stem, shaping a stem, Stem repairs, stem work, stripping a lacquer finish, super glue, vulcanite, waxing, waxing a stem on August 26, 2018 by rebornpipes.